The token is corrupted. 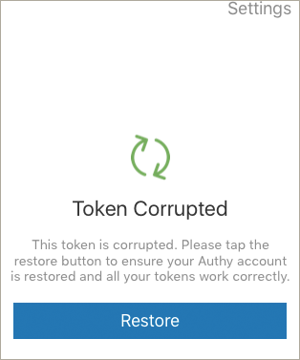 Please tap the button to ensure your Authy account is restored and all your tokens work correctly. An error during decryption from a backup, which causes the local decryption to be invalid while the backup is still fine. To solve this, click the Restore button or reinstall the app. If the issue persists, contact Authy Support for further assistance.